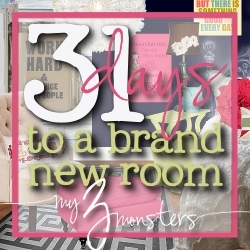 If you're joining us for the first time today, this is day 8 of a 31 day series about how to give a room in your home a brand new look, from top to bottom, completely DIY. You'll find links to all the other posts in the series here, if you're interested. Today it's finally time to dress the window. We already have wood slat blinds for light control so anything else we add is purely decorative. It's not a huge window so I like something that goes floor to ceiling to give it a little more oomph. And I'm all about bang for the buck, as you well know. I loved how the wide horizontal stripe paint job in the kids' bathroom turned out and I thought this room could use some similar graphic impact. 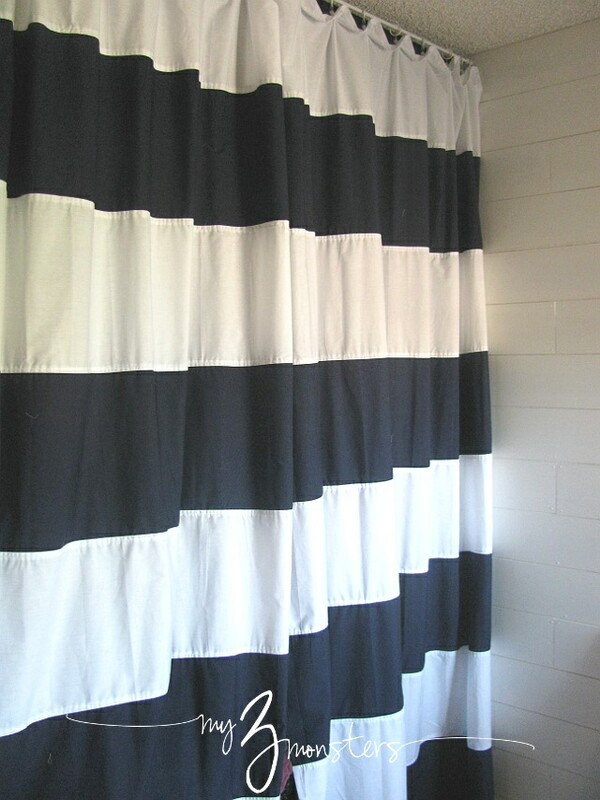 I decided to make navy and white horizontal striped curtains out of . . . .
Yep, you heard me. 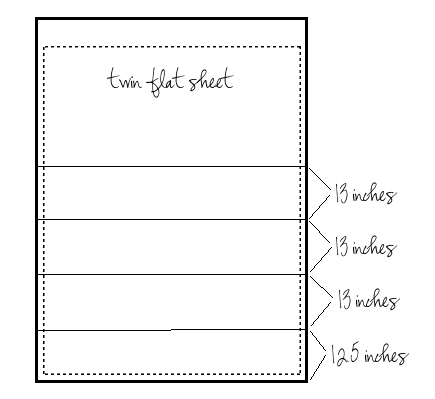 Walmart has twin flat bedsheets in a wide variety of colors for only $4.47 each. I took a chance and bought a few even though I didn't have a paint swatch with me. Luckily, their navy blue happens to be a pretty great match to my paint color. The ceilings are 8 feet tall in this room, so for simplicity's sake I decided to do eight 12-inch horizontal stripes. Continue sewing strips together, alternating colors, until you finish with the navy blue strip that has a long hemmed edge. Press it all nice and flat. 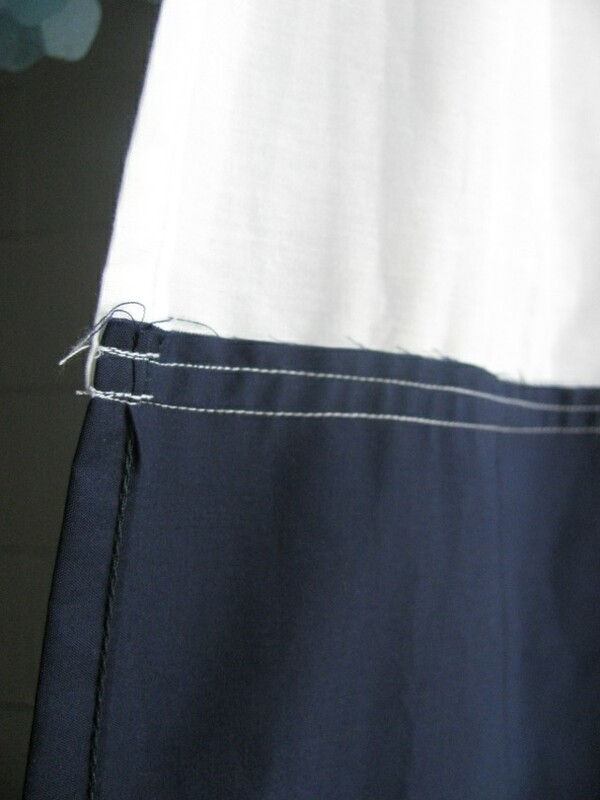 Along the top edge, I made several evenly-spaced small pinch pleats and clipped on some curtain clips from IKEA. Feed the rings onto your curtain rod and you're all set! 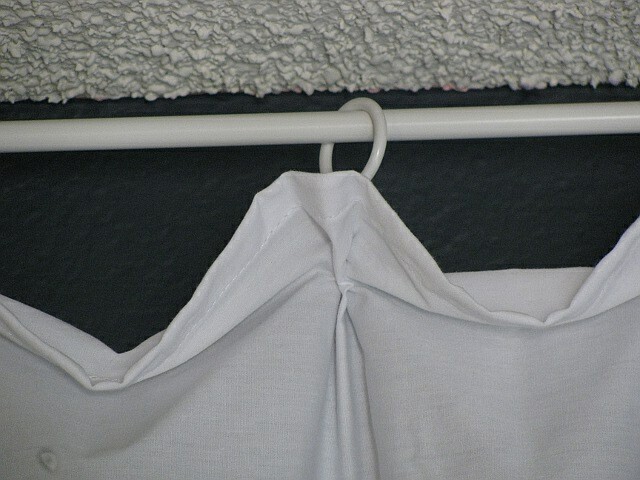 The rings from the curtain clips make the panels slide open and closed easily along the rod. I liked the way it looked on the window so much, I decided to make two more panels to replace the closet doors. It just gave the room a prettier look. Since the panels are so lightweight and slide so easily, they give Sydney much easier access to her clothes in the closet. Thanks for checking in on this project today! 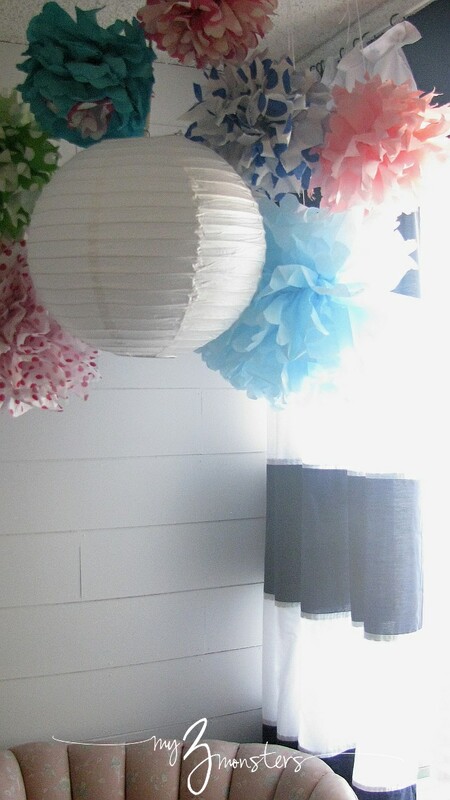 Tomorrow I'll show you how I freshened up the light fixture. Again with the adorableness! 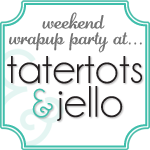 I eagerly check in every day to see what's next - so fun! Awww, thanks Cynthia. I still think of Olivia as a little kiddo, but she's getting so grown up. Copying is really the only kind of crafting I do, too. I figure cute is cute, even if I'm not the first one to think of it. We need to do another "reunion" soon -- I miss my college besties! These are gorgeous! I'm dying to make some of my own horizontal striped curtains for my living room in white and burnt orange, only problem is finding the right coloured fabric! Thanks! You're right, the hardest part is finding the right fabric. Good luck!